In this article, you'll learn how give students exceptions for assignments. Exceptions let you adjust the assignment's availability and due date to accommodate specific students. 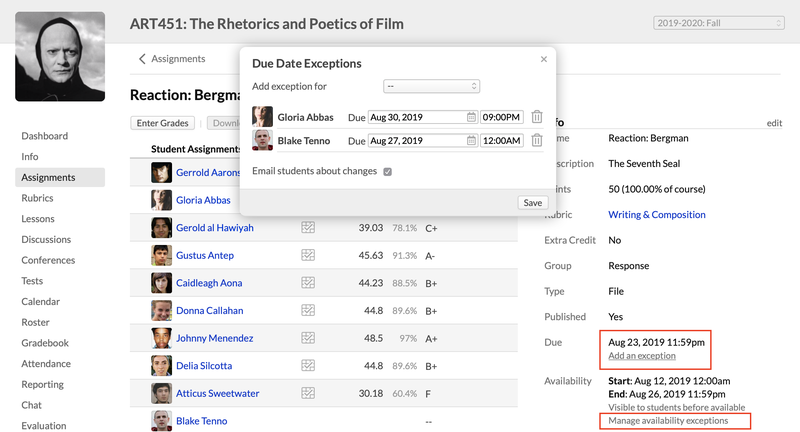 For example, you could extend the availability of a particular assignment so that a student who's catching up after an illness can submit work at a later date than the rest of the class. Exceptions are particularly helpful for incomplete students who've been given extensions to finish the course after the course end date. Here's how to add an exception. Go to the assignment's page. While you can find links to assignments in a number of places in your course, the best spot would be the main Assignments view. Under Info in the right column, click Add an exception under either the Due Date or Availability settings. In the dialog, select a student from the drop-down. Enter the new due date or availability dates/times. Each student can have a unique exception time. Check to email the students about these exceptions (and any changes you might make later). Repeat the above steps as often as you need. Once you save, Populi will email the student about the assignment exception; he'll also see an alert on the Course Dashboard about it when the time comes.